What are some examples of large multilingual zones with internal open borders? The EU (particularly the Schengen area) comes to mind, but it’s relatively recent, and most parts of the EU are quite well-developed. A perhaps more interesting example, particularly for those concerned about the Third World, is internal open borders and intranational migration within India. I intend to cover India in a series of two blog posts, of which this is the first one. This post (part 1) discusses the size and diversity of India, whether India truly has open borders, relations with nearby countries, secesssionist movements, and overall migration statistics. In part 2, I’ll look more closely at local attitudes to migration, the economic data on migrant performance, as well as episodes with unusually high levels of immigration and emigration for specific regions, usually in the wake of natural or man-made disasters. The population of India is a little over 1.2 billion. Compare this with the population of Europe (about 800 million), Africa (about 1.1 billion), and the European Union (about 500 million). India is linguistically diverse. Hindi is the most widely used native language in India, and it is the main language of North India, though it comes in many dialects, many of which differ considerably from the version taught in schools. There are an estimated 180 million native speakers of Hindi, or about 15% of India’s total population, though probably a larger percentage of the population (perhaps up to 50%) has a working knowledge of Hindi sufficient for rudimentary oral communication (such as in shops or restaurants). Due to linguistic diversity, English is widely used as a language of official communication within the country, and English fluency is considered a marker of high status, opening access to a wide range of jobs. Wikipedia lists 22 major regional languages in India, each with its own well-developed script and grammar. Some of these languages, including Hindi, have well-developed literatures of their own, and some have movie industries (the biggest of these, Bollywood, is the world’s second largest movie industry after Hollywood, and might well overtake Hollywood on some metrics in the near future). The linguistic diversity of India is in the same ballpark as that of the European Union, which lists 24 official languages and 3 semi-official languages. India and the EU are also similar in that English plays an important role as a language for official communication. While English knowledge of the EU residents as a whole is greater than that of Indians, the most educated Indians probably have comparable English knowledge to the corresponding top slice of EU residents (outside the United Kingdom), because the bulk of higher education in India is in English. Intranational disparities in income, wealth, and other indicators in India are comparable to those between EU countries, with the most extreme gaps being in the 2-3X range, except for a few very small and highly prosperous states (Sikkim in the case of India, Luxembourg in the case of the European Union). Compare the list of Indian states by GDP and list of European countries by GDP (PPP) per capita. (This post by my co-blogger Hansjoerg Walther might also be of interest). In the European Union, the most prosperous countries are in the northwest (UK, France, Germany) and the Nordic area (Norway, Sweden, Finland, Denmark). In India, Punjab in the north is relatively prosperous due to agriculture, and the states of Gujarat, Maharashtra, and the southern states are prosperous due to a mix of proximity to sea ports and a relatively more educated and modern population. The poorest states are the north-eastern states, Uttar Pradesh, Bihar, Madhya Pradesh, and others in the central part of India. I’m not aware of research that attempts to compute place premia within India, but my guess is that they’d be somewhat but not much narrower than the gaps in GDP per capita. In other words, I do think that skill differences account for part of the wage difference, but the huge scale of internal migration (discussed later in this post) suggests that people do see wage gains upon migrating. The Chinese government has heavily restricted migration in a fairly systematic way for quite some time via the Hukou system, although they seem to be relaxing these controls. In India, the freedom of movement within the country is enshrined in the Constitution of India (see Fundamental Right #2 in the list of fundamental rights), and there are, to the best of my knowledge, no generic de jure or de facto legal barriers to migration. There do exist barriers to effective access to welfare state privileges associated with residency, and access to some government services and privately provided services is hindered due to a lack of knowledge of the regional language (particularly so for people who lack fluency in English and even more so for people who don’t know Hindi either) — more on this later in the post. But as far as the physical act of movement and relocation goes, “open borders” is certainly the right term. It’s not different in any meaningful way from freedom of movement between the member states of the United States. 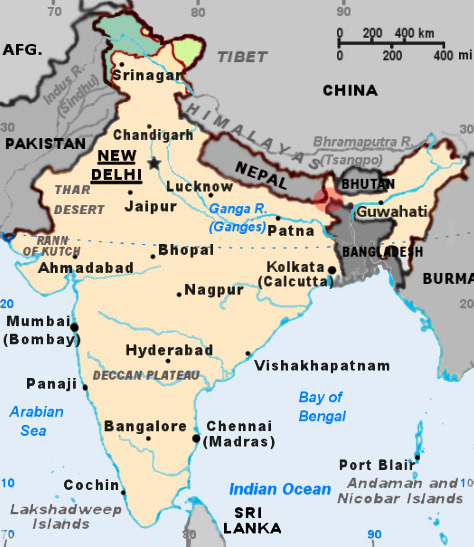 India has open borders with two of its land neighbors, Nepal (more here) and Bhutan. 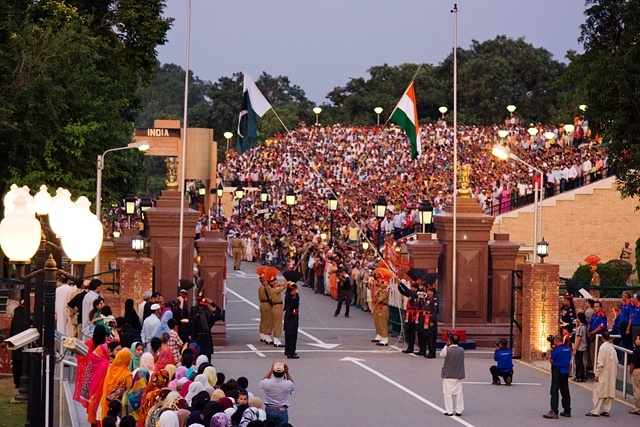 Relations with other neighbors are somewhat more hostile: Pakistan and India have tense relations largely due to disputes over Kashmir. 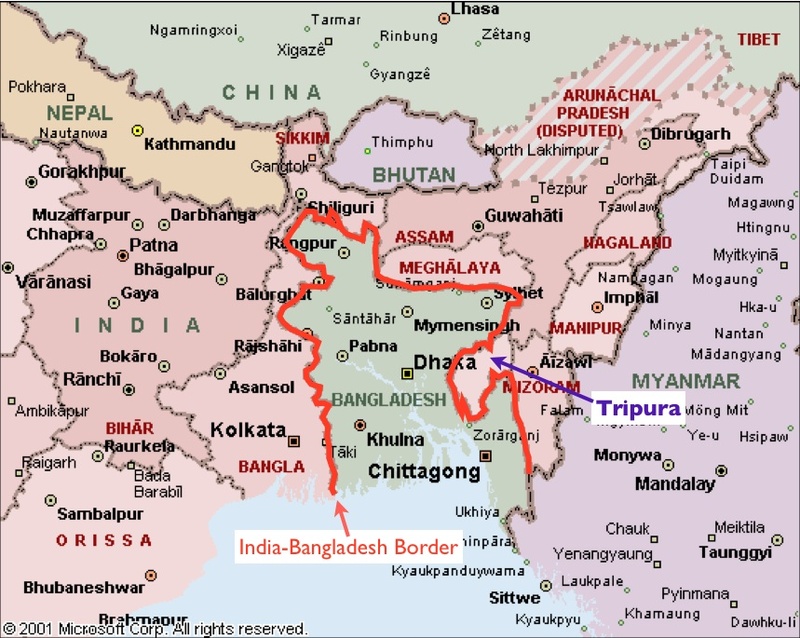 India also shares a border with China, Bangladesh, and Burma (Myanmar) but does not have open borders with any of them. Tibet, which is close to India, has also sent many refugees to India. India is physically close to Sri Lanka. Sri Lanka is a short distance over water from the southern tip of India. Relations with Sri Lanka have been tense and have fluctuated over the years (long story). Anyway, with the exception of Nepal and Bangladesh, none of the other countries have sent significant numbers of migrants to India, either in absolute terms or as a fraction of their populations, nor have Indians emigrated to these countries in great numbers. So for the most part, India is a closed system with internal open borders but little human interchange with the nearby world. There is emigration to faraway places (skilled emigration to the First World, plus some emigration to the Gulf States and other parts of the world) but a discussion of that gets us too far afield. How has India managed to survive as a single country for so long? That’s a puzzle with perhaps no satisfactory answer. There have been a number of separatist movements. See this Wikipedia page for more information. None of the movements have continued for a very long time, and the grievances expressed in the movements have usually been either suppressed or accommodated through “keyhole solutions” (such as carving out a separate smaller state for the aggrieved parties, allowing for official recognition of their language, etc.). Some of the nationhood demands may well have been ambit claims, though I don’t have enough subject matter knowledge to be definitive. The main exception is Kashmir, where a non-negligible fraction of the population has been interested in seceding from India for a considerable length of time, some of them desiring independence and others wanting Kashmir to join Pakistan. Pakistan too has had a vested interest in Kashmir. Kashmir’s accession to India was accomplished via the decisions of an unelected ruler and a popular political leader back in 1947, but the decision may not have had strong support on the ground, and Pakistan’s government has had a vested interest in helping foment dissatisfaction against the Indian government. With the exception of Kashmir and smaller movements in the North-East, secession movements have not been active in India of late. I expect that if India’s economic growth continues apace, popular support for secession will continue to fall, as people prefer access to a wider economy over forming a nation better suited to their ethnic self-concept. India’s overall prosperity would be lower (perhaps comparable with Pakistan or Bangladesh, though probably a bit better) if it had split up into multiple nation-states that had peaceful relations but imposed restrictions on trade and migration with each other. There would be more variation between the economic regions of India. I expect that the most prosperous states of India would probably do about as well as the most prosperous states of India do today, but the least prosperous would do considerably worse. It’s possible, though, that politics would have moved somewhat differently, and some states would have done better as independent states. There is more uncertainty at the level of individual states. There would be a higher probability of a few impressive success stories, i.e., countries with income levels similar to Mexico or Malaysia, under a split. But I don’t think any particular region of India could predict with high probability that that particular region would take off as a success story, so in expectation, I still think most regions would be better off staying as part of India. Of course, in principle, there is no conflict between having separate nation-states and having open borders and free trade, and my intuition is that this might well be optimal, but the option is currently not really on the table. One possible move in that direction, without sacrificing national unity, would be to move towards shifting more responsibilities to the states rather than the central (federal) government. This is unlikely to happen because the manner of separation of duties is specified in the Constitution, and currently heavily favors the central government, even giving it precedence on items that are in a joint list (the Concurrent List). A huge amount of intranational migration is rural-to-urban migration. Unsurprisingly, the states with the most rural populations (Uttar Pradesh and Bihar) are the states that send the most migrants to other states. In general, migration flows seem to go from states with lower per capita income to states with higher per capita income, and the same phenomenon is observed for intra-state migration. But this is closely related to the phenomenon of migration being rural-to-urban. The 2001 census recorded 191 million people who had migrated to a faraway district or different state. This was 20% of the population at the time. About 70% of internal migrants were women, and their main motive for migration was marriage. Males who migrated were largely motivated by economic reasons (looking for jobs). The total proportion of migrants is close to 30% but this also includes people who migrate short distances to nearby places. (This UNICEF report from 2012 also gives the 30% figure). A large fraction of labor migration is short-term migration. The migrants are generally not highly skilled, but it’s unclear how their skill level compares with the population as a whole, given that the Indian population in general is not highly skilled. Most labor migrants are employed in a few key subsectors, including construction, domestic work, textile and brick manufacturing, transportation, mining and quarrying, and agriculture. Documentation and identity: Migrants often lack appropriate documents to establish their identity and establish residency and therefore have trouble accessing both government-provided and privately provided services. Housing: Migrants typically live in slums in conditions that are often more crowded than where they came from. The informal nature of their housing adds to the challenge of establishing residency necessary for accessing various services. Limited access to formal financial services: We’ll discuss this more in part 2. Political exclusion: We’ll discuss this more in part 2. Rampant exploitation: We’ll discuss this more in part 2. Stay tuned for part 2, where I’ll look more closely at local attitudes to migration, the economic data on migrant performance, as well as episodes with unusually high levels of immigration and emigration for specific regions, usually in the wake of natural or man-made disasters. Open borders within India (part 1) is licensed by Vipul Naik under a Creative Commons Attribution 3.0 Unported License.